Saturday morning Breakfast is arugably one of my FAV things in the world! To me, there is nothing better than sleeping in and waking up to a breakfast feast! Today held this kinda morning- and it was glorious! I woke up feeling inspired and adventurous. I grabbed a friends base pancake recipe, and began to create my own! 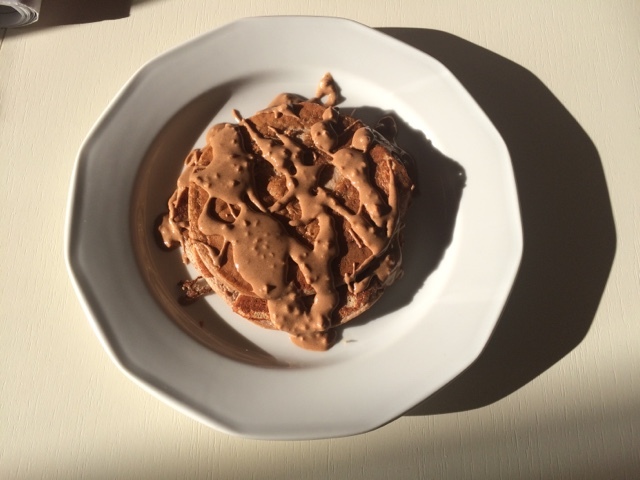 I came up with Choc Banana Protein Pancakes drizzled in Protein Packed Chocolate Crunch Sauce! Eyy Curamba!!! I think my heart might burst at the memory of the taste!! I truly impressed myself, which actually doesn't happen to often cuz somehow I find a way to mess things up generally ;) BUT, this Saturday, the adventure led to a great discovery!! Mix all ingredients into a blender and blend! Then cook like normal pancake batter. Melt PB in sauce pan on low, as it melts, stir in the chocolate protein. Once you have melted the two together, take off heat and drizzle over pancake stack! Sweet, sweet Saturday! Try these, share and please tag me in your posts/pics and let me know!! For a pancake lover as myself, these were perfect! Hit the spot and NAILED a sweet tooth crave of mine WITHOUT the guilt! I can't wait to try these! What's your favorite chocolate protein to use?